Women at every level of an organization can be strong leaders—bringing essential skills like team leadership, strategic thinking and business acumen to their roles. To flourish as a leader, a woman needs not only the skills to lead, but a dynamic voice that can be heard and followed. This unique 2-day program will provide you with the knowledge and tools to position yourself as a present and future leader, and to speak up and create value for your organization, no matter what your role. You’ll go beyond the fundamentals of communication and assertiveness skills and explore vision, negotiation and strategy—as well as powerful techniques to enable you to find your leadership voice and lead with courage and conviction. First, the course will focus on self-awareness and effectively leading yourself. Next, your focus will shift to leading others and presenting yourself as someone who creates and adds value. 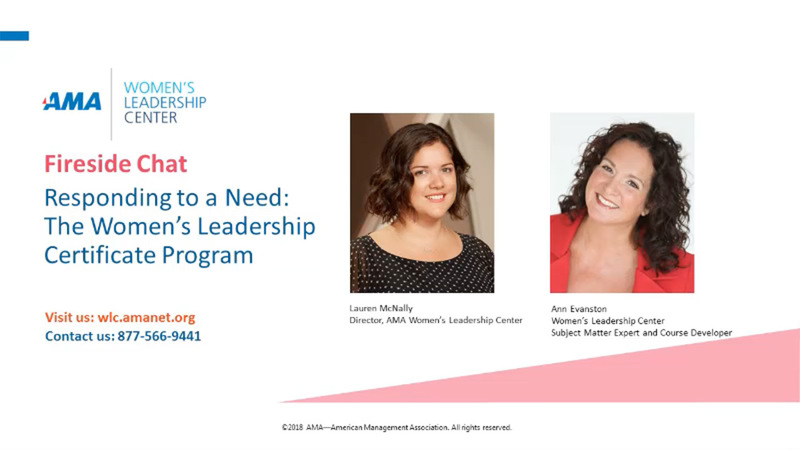 Upon completing this unique course, you’ll receive a special AMA Women’s Leadership Certificate, indicating that you’ve received in-person, hands-on training in leadership areas that are crucial for women who lead in business.